The evolved Laser Interfermoter Space Antenna (eLISA) is a mission aiming at exploring the Gravitational Universe from space for the first time. It involves scientists from eight European countries ‒ Denmark, France, Germany, Italy, The Netherlands, Spain, Switzerland, and the UK ‒ as well as the support of several US-based ones. “The Gravitational Universe” theme (with eLISA as foreseen implementation) was proposed to the European Space Agency and selected as a science theme for the third large-class mission to be launched in 2034 within the agency’s Cosmic Vision science program. The eLISA mission consists of a “Mother” and two “Daughter” spacecrafts. These will orbit the Sun in a triangular configuration, as shown the figure. The three satellites will form a precision interferometer, with the two Daughter spacecrafts connected to the Mother one by 1 million km long laser beams. This interferometer will be capable of detecting gravitational waves at frequencies in the range of 0.1 mHz to 1 Hz. Such a frequency interval is not accessible on Earth due to arm length limitations and to noise caused by the terrestrial gravity gradient noise: in this sense, eLISA will complement the efforts of ground-based gravitational-wave detectors. eLISA is designed with orbits that allow the three satellites to maintain their near-equilateral triangular configuration. Indeed, because of their special orbits, they are seen to rotate about an axis passing through the centre of the triangle and normal to its plane. A passing gravitational wave alters the proper relative distance between the spacecraft, which will be sensed by detectors on each spacecraft. eLISA will coherently measure the frequency, phase, and polarisation of gravitational waves passing through it, allowing scientists to resolve overlapping signals and locating them on the sky. The former will be achieved with sophisticated pattern recognition algorithms capable of digging signals out of noise, by exploiting Einstein’s theory to predict the precise nature of signals emitted by several types of sources. Sky location, instead, will take advantage of eLISA’s annual motion around the Sun: this causes a signal to be Doppler modulated in a way that specifically depends on the sky location of the source. This capability is particularly appealing because eLISA will have an all-sky field of view, that is, it will be sensitive to sources in any direction of the sky. The low-frequency part of the spectrum of gravitational waves will witness sources in our own Galaxy as well as those in the very distant parts of the Universe. Binaries consisting of ordinary stars as well as white dwarves and other exotic objects, with periods of several mins to a few hours will be visible in LISA. Indeed, there will be so many that only the strongest and nearest of these binaries will stand above the stochastic background created by the numerous others in this band. LISA will also be able to see the coalescences of galaxies occurring anywhere in the universe by detecting the inspiral and coalescence of supermassive black holes believed to lie at the centre of galaxies. 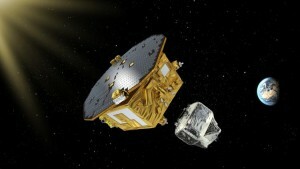 The eLISA mission technology is being tested in space with LISA Pathfinder (LPF). 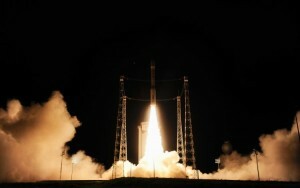 LPF was launched successfully on 3rd December 2015 at 4:04 GMT, onboard Vega VV06, from Europe’s Spaceport, French Guiana. A picture of the liftoff is shown in the picture. LPF was placed in a low-earth transfer orbit. From there, the satellite used its propulsion module in order to reach the operational orbit around the Lagrange point L1 (22nd January 2015). Here, LPF’s two test-masses will be in a nearly perfect gravitational free-fall. Innovative technological devices will be used to control the masses and measure their relative motion with unprecedented accuracy. The test-masses and their environment will be the quietest place in the solar system. Because LPF is such an extremely sensitive gradiometer that can measure changes in the external gravity gradient on timescales of 10’s of minutes, it could be used to test the behaviour of gravity in its weak regime. A number of theories of gravity which differ from Einstein’ one were proposed over the years as an alternative to invoking dark matter to explain the observed galactic rotation curves. In the weak regime, these may present a characteristic acceleration scale below which deviations from Newtonian dynamics should be detectable, contrary to the case of General Relativity. 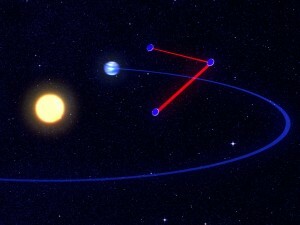 At the Earth-Sun saddle point, the Newtonian background drops below this characteristic acceleration scale. Therefore, scientists, including Cardiff University personnel, are studying possible LPF mission extension scenarios to navigate the satellite from L1 to the saddle point and the data analysis techniques required to perform this test of gravity.